I think I've talked about how when it comes to manga and Japanese reading, I prefer somewhat educational fare. Often they're called コミックエッセイ (comic essays). There's one I've been picking away at on and off for about a year now. Usually I go through them quicker, but this one is a little more difficult than the likes of ダーリンは外国人 (My Darling is a Foreigner) and 日本人の知らない日本語 (Japanese that Japanese People Don't Know). This one is called 意外に知らない間違いやすい漢字 (Unexpectedly Easy to Mistake Kanji), and as you might expect, the subject matter contains a lot of difficult kanji distinctions. Still, interesting material. Throughout the book, characters talk with their teacher about Japanese characters, words, and expressions that perplex them or that they're unsure of. 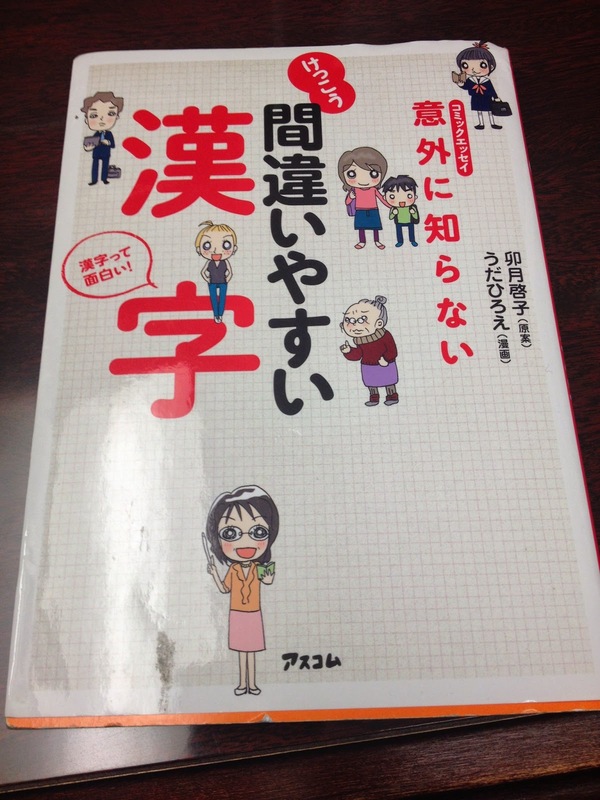 There's one frame at the end of a chapter where a character humorously mixes up two 四字熟語 (4-kanji compound idioms) about falling and is corrected by an old woman. That's what I wanted to share today. 七転八起 (しちてんはっき). Let's break it down for the sake of analysis. 七 (7), 転 (turn around, change; this kanji is often also paired to mean some kind of "fall"), 八 (8), 起 (get up). So somewhat literally "7 turns, 8 rises." Or stretching a little further, if you fall 7 times, get up 8. This expression is sometimes used to denote that life is full of ups and downs, but also as encouragement to keep trying. 七転八倒 (しちてんばっとう). Again we see 七転 (7 turns), plus 八 (8) 倒 (fall, collapse). So this time we have 7 "turns" or falls, and 8 more falls or "collapses." This basically means someone writhing in agony; they've fallen 7 times and collapsed 8 times (I picture someone doubling over and then falling completely afterwards instead of getting up). I can't think of any similar English expressions for that second one. Any ideas?